I’m supporting an interesting new project for Metro, an elected regional government for the Portland metropolitan area, in collaboration with Professor Nancy Cheng of the University of Oregon School of Architecture and Allied Arts. Metro has used a number of urban planning tools to chart regional population growth driven by climate parameters. Although Metro has amassed large amounts of data, visualizing the data’s urban scale impact is quite a challenge. For this project we’re utilizing Esri® CityEngine®, a tool used to develop urban landscapes for urban planning, architecture and even films like the recent Superman movie. CityEngine’s help file provides this example of a Greek temple construction using CGA rules. 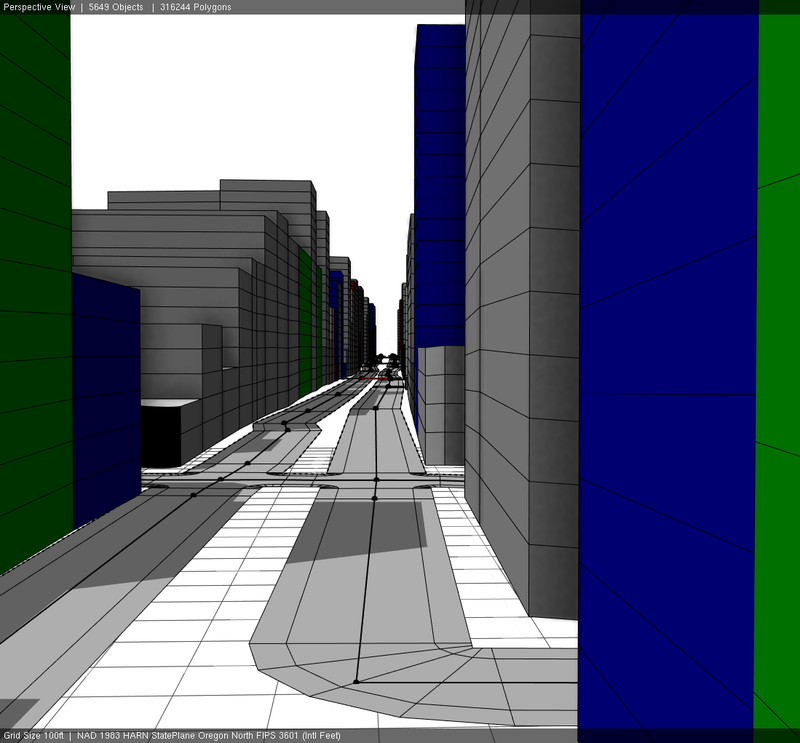 Traditionally CityEngine uses a proprietary rule-based shape-grammar known as “CGA” or “Computer Generated Architecture” to generate form. The CGA format provides flexible parametric form generation, but is not particularly useful for implementing computational tasks and algorithms for data manipulation. CityEngine also has a python console interface, useful for programming but of little value in shape generation. Neither language interface alone provides all the capability needed, but combining the two capabilities, we are able to process data from the climate models, select potential development sites based on GIS data, and interactively generate buildings on those sites while adjusting the parameters of the CGA files that control their form. Aerial view of Portland’s Gateway District with arbitrary buildings color-coded by assessed property value. The above image illustrates the process using simple colored block-shaped buildings. First, we loaded GIS based tax maps of Portland’s Gateway district with annotations of the assessed lot values into CityEngine. In Python we then calculated average value per-square-foot, and assigned a property category based on whether the site value was below, above, twice or three times above average. 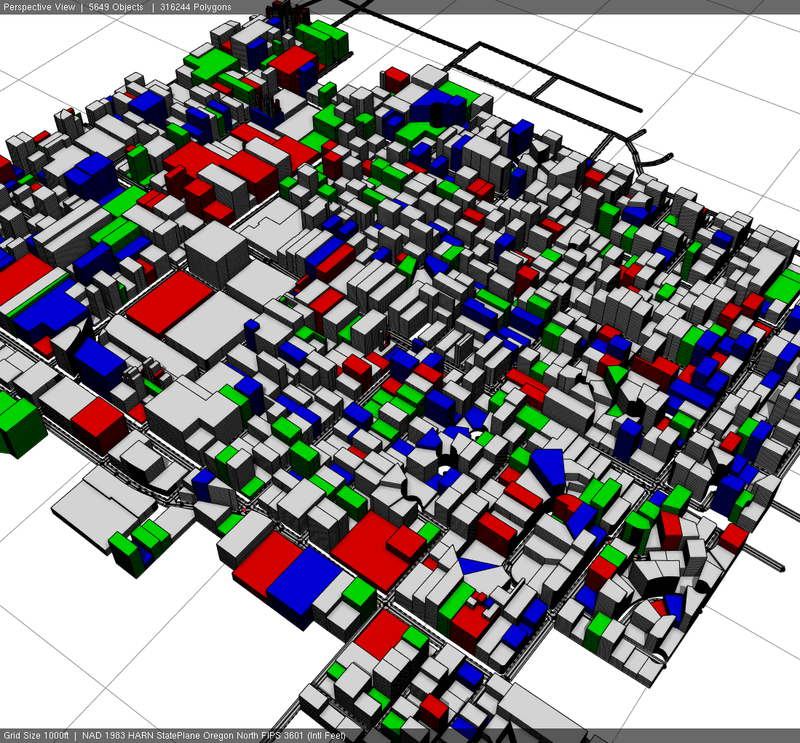 The CGA rules then quickly generate the block shaped buildings of randomly selected heights and different colors for each category. The resulting images may be used as-is, developed to a more sophisticated level in CityEngine, or exported and refined further in Photoshop or other 3d modeling tools such as SketchUp. Street level view of the Gateway District example. 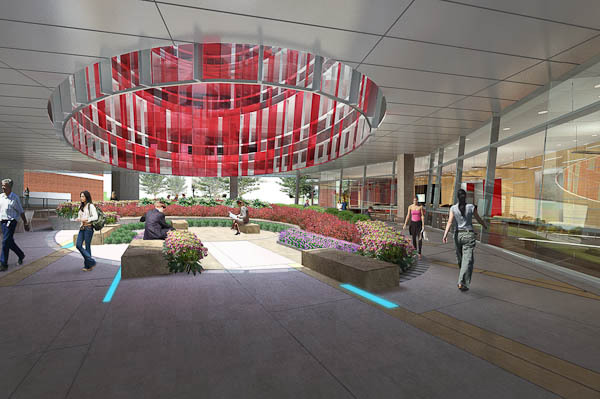 HDR Rendering of the pedestrian plaza below the ellipse. Window panels are colored red and white in keeping with the University of Maryland’s colors. The newly constructed Physical Sciences Complex on the campus of the University of Maryland in College Park, includes a beautiful elliptical oculus passing upward through a three-story office bridge over a pedestrian plaza space. Created as an iconic architectural landmark, the opening is designed to have much the same visual impact in the space below as the Pantheon’s in Rome. Inside the building, open pedestrian spaces surround the curtain walled oculus, adding an additional dimension to the experience of the space. Yellow dots show the area exposed to direct solar gain, orange shows reflected gain, and red shows the hot zone resulting from many reflections concentrated in one location. The orange dots on the western face of the ellipse show the contributing curtain wall panels. Unfortunately, the installed glass curtain wall system is also highly reflective and creates a solar convergence to rival those at the Vdara Hotel and Disney Concert Hall. The elliptical form of the opening does not create as precise a focus as does the curve arc at the Vdara, but it is nonetheless highly effective at concentrating light rays into one area, resulting in a hot spot intense enough to melt polystyrene panels being installed into the space. Highest heat loads are generated in the late afternoon as the western sun reflects off the east face of the ellipse. HDR architects asked me to assess the intensity and location of the hot spot, which I accomplished using a combination of Heliotrope and additional Slate Shingle modeling and solar routines. I found that the hot spot below the ellipse is active throughout a 6-hour mid-day period for 3 months before and 3 months after the summer solstice. Furthermore, the changing curvature of the ellipse moves the hot spot as the sun moves, creating a pattern of focus that changes throughout the day. These images illustrate the patterns of light movement that create the hot spot in the plaza. Fortunately they are mostly confined to an earth berm intended, not for human inhabitants, but for plantings. The heat levels are too high for even the hardiest of cacti, however, leading to some tough redesign decisions. Possibilities include testing to see whether window film treatments are sufficient to mitigate the problem, or designing and installing shades to either mitigate or eliminate the convergence entirely. Tim Waldock detailed the process of recreating the Calatrava’s Oriente Station using repeater elements. Three days spent last week in the lovely city of Vancouver, British Columbia at the Revit Technology Conference North America. An excellent alternative to the frenzy of Autodesk University, so long as all you are interested in is talking about Revit. Frankly, its a little amazing (and perhaps a bit disturbing) to see this many people gathered in one place all willing to talk about Revit for three days solid! 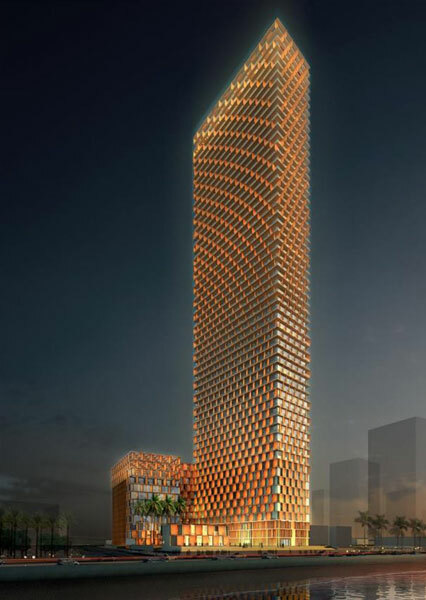 Helen Gorina of Perkins+Will demonstrated the modeling process used to create the sails on the Kempinski Hotel and Tower in Jeddah. A few of the conference highlights for me were seeing the latest work on Dynamo presented by Matt Jezyk and company of Autodesk, some excellent insight into the Revit API from Harry Mattison of BoostYourBim, amazing parametric work by Marcello Sgambelluri using the new Adaptive Components tools, and time Waldock’s attempts to force-feed fractals into Revit. His work on recreating the geometry of Calatrava’s Oriente Station in Lisbon was particularly well done, as was Helen Gorina’s presentation on Applying Math and Logic to Facade Design. Two images from those presentations here. 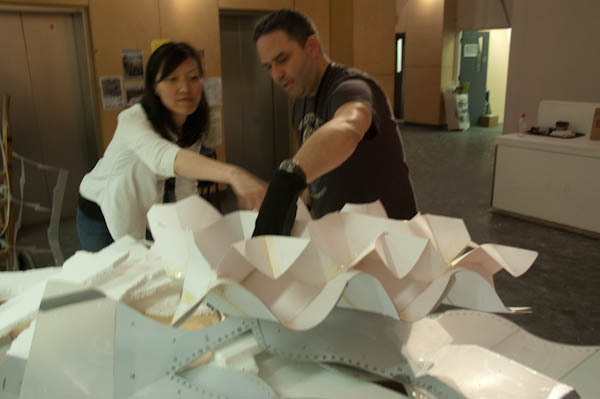 Over coffee last week with Jonah Ross, a fellow parametric designer with Zimmer Gunsel Frasca here in Portland, our conversation turned to the term “parametric modeling,” how ill-defined it is, with so many different meanings and contexts. Does modeling in Rhino/Grasshopper make you parametric? Can you be parametric in Revit? Is it form? Is it structural analysis? Or are you parametric because you have little slider knobs and can manipulate your model? So yesterday I was pleased when another colleague, a traditional architect, asked me what the term meant. This time I had a clearer answer to give him: parametric modeling is way to introduce the scientific method to your design process. In science you first define a control experiment or observation point. 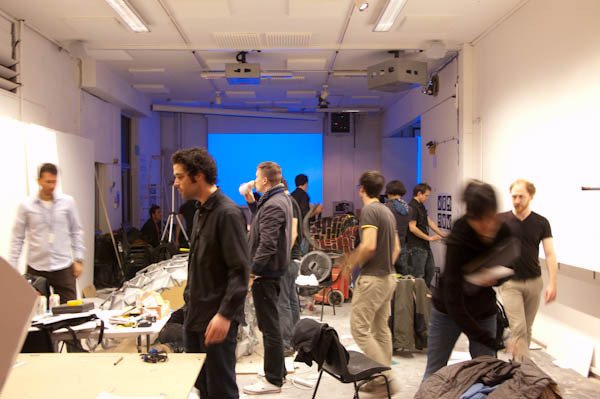 From there you vary one or more independent variables to explore a space of possibilities. You gain understanding about the space of study by restricting yourself to just a few variables and observing the effect on the problem as a whole. A parametric model uses precisely the same approach. 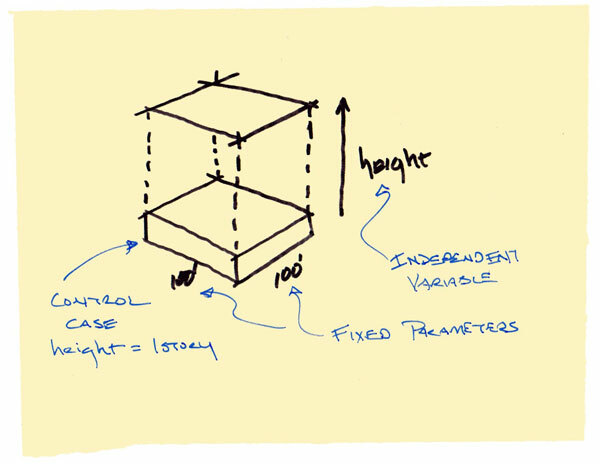 We first create a base model, say a building that is 100 ft. by 100 ft. by 1 story tall. We next identify the variable or variables we wish to study, such as the building’s height. We can now study how our building design changes in relation to that one variable’s changing value. How we evaluate the results depends on our design interests. Perhaps it is floor/area ratios vs. building height. Or shadow studies. 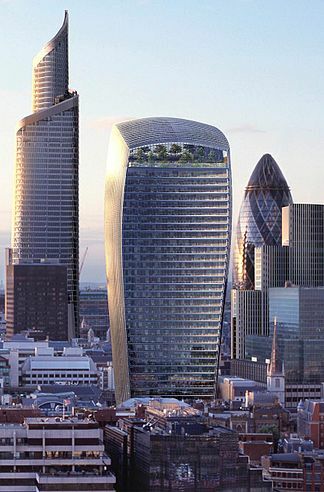 Or simply design aesthetics and whether we like a shorter or taller building. 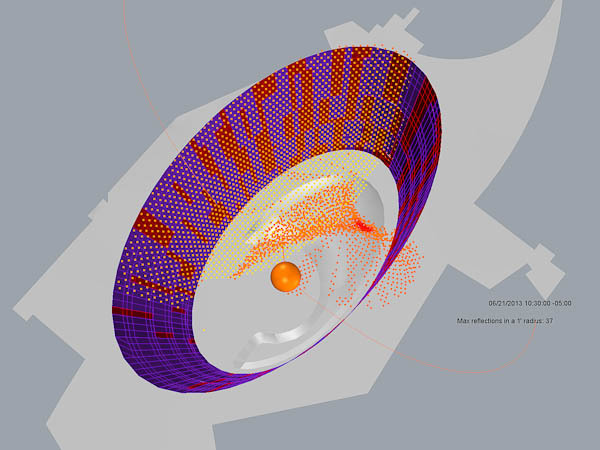 Using an independent variable and comparing how it changes our base design allows us to quickly and efficiently explore the design space affected by that parameter. Parametric models are not necessarily computational. 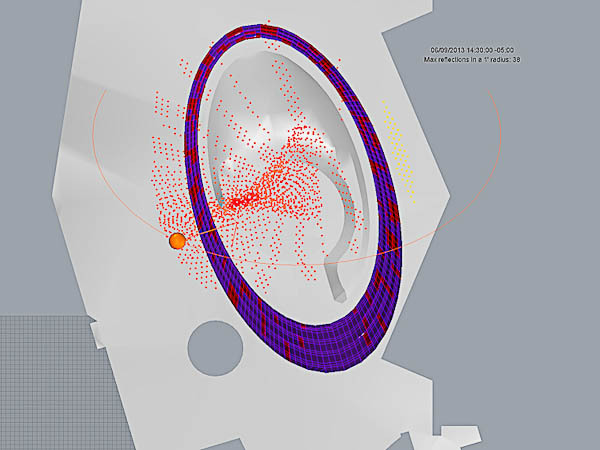 But unlike creating multiple physical models of the same problem, it is relatively easy to modify and analyze successive cases using 3d computational tools. A parametric model with initial control state and independent variables to change it. It’s important to remember that the independent variable does not have to be a number controlled by a slider in a Grasshopper script. While anything in a computer model can ultimately be boiled down to numbers, specifically 1’s and 0’s, in a design study we may want to be more abstract. A parameter could be a curve defining the shape of a dome, for example, as in the Parametric Nervi study of the Palazzetto dello Sport model I developed when first studying parametric models. Rhino knows the mathematics of the curve I’ve drawn to define the shape of Nervi’s dome. But as a designer, I only want to think about that curve and what it does to the shape of the dome as I manipulate it, not about the numbers. In this instance I would not use a slider to explore my parameter space. Instead I would change the shape of the curve directly and if I want, save the different variations I try. This model of Nervi’s Palazzetto uses curves instead of numbers as parameters. 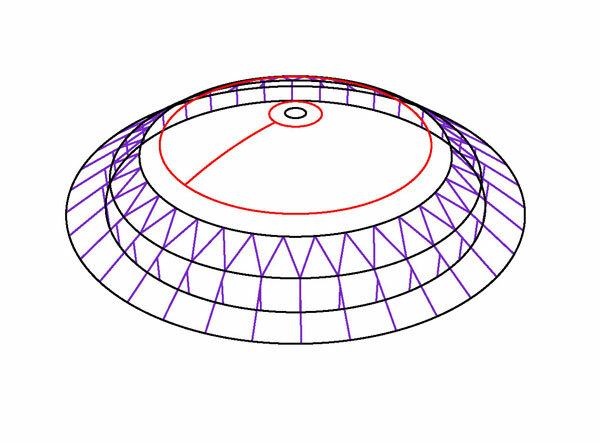 Here the two red circles define the beginning and ending of the dome and the arc connecting them defines its shape. An additional advantage of using a parametric approach is the opportunity to study not just the individual data points tested, but the overall response of the design to the changing values of the variable. If we change our proposed building’s height from 1 story to 100 in steps of 1 and the neighborhood association starts threatening lawsuits after we get to 40 stories, we’ve learned something important about the responsiveness of our design problem to that variable. We can thus derive a “feel” for the variable – how much the design resists or whether the variable is inconsequential – as we change it back and forth. Because of the immensity of the multidimensional design space architects face each day, the thought of using the scientific method to explore it is indeed overwhelming. Just as a scientific experiment becomes useless with too many variables, a parametric model can become ridiculously difficult to create and maintain. We can, however, identify critical portions of the design space and specific variables under our control and, using a parametric approach, explore that specific response to its changing values. Obviously there is a trade-off between over-analyzing a design problem and meeting budget and overhead constraints and tight delivery schedules. But by first using forethought and intuition to identify the right set of variables to study, a parametric model can be an enormously valuable tool in real and practical design processes. Solar is in our near future and it’s in the news. Its huge potential impact on the existing grid and power industry was recently discussed on Grist. Likewise, Solar Today, the magazine of the American Solar Energy Society (ASES), published an article in their May/June edition on preserving solar access on properties with solar array installations. Clearly if you’ve spent a few tens of thousands implementing a large photovoltaic (PV) array on your home or business, you’ll want to protect the solar energy it’s there to collect. But in most places, including my home city of Portland, Oregon, height restrictions on buildings don’t currently apply to trees. In fact our city government protects its tree citizens as much or more as it does its human constituents. (I am an avid “tree hugger” myself and happy to live in our fair green city.) Indeed, solar farms exact a heavy cost on surrounding ecosystems, as is well expressed in a recent article posted on Red Lodge Clearinghouse. 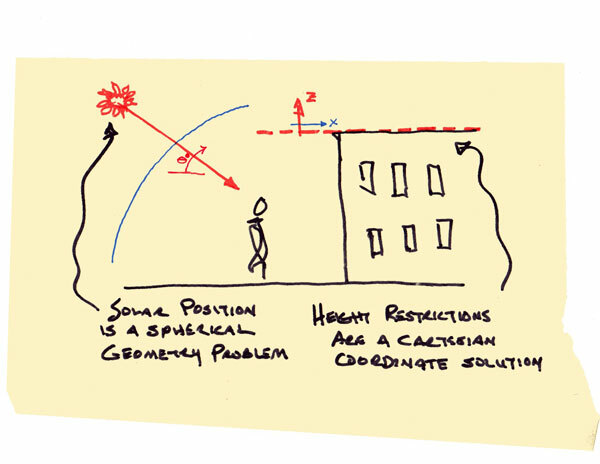 Solar access depends on spherical geometry while height restrictions are Cartesian based. For now, lets assume solar panels are great, that they should have precedence over neighbors’ buildings and trees. Even so, imposing flat height restrictions to protect solar access is an oversimplified approach to the much larger and more complex problem of “rights to light” or “rights to view” laws. That’s because height restrictions are a Cartesian coordinate solution to the spherical geometry problem of view and solar access. In other words, a height restriction places a plane at a fixed height above a site using a local, flat earth view of the world. However from that same local point of view, solar position and field of view are actually windows onto a sphere surrounding the viewer. 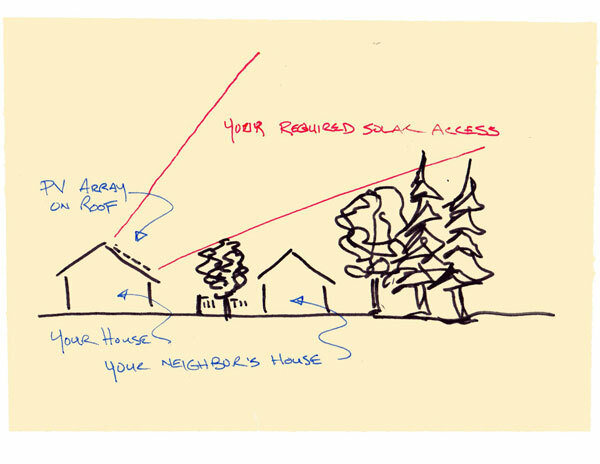 If, for example, your neighbor plants a 50 foot tree on the far side of his lot where it casts no shade on your PV array, why should you impose a restriction on him based on the twenty foot tree limit you need on your side of his lot? A flat height restriction on your neighbor does not accurately account for your solar access needs. For these reasons, the concept of “solar envelopes” developed in the 1980s by Ralph Knowles of the University of Southern California School of Architecture, is a much more interesting and effective solution to the problem of solar and view access. Dr. Knowles defined shadow “fences” or lines which could not be shaded by adjacent structures or trees. He then geometrically projected these fences outward to restrict the edges and heights of adjacent structures. Or trees. Solar envelopes may be used to concentrate building volumes to the south or center of their sites, thus allowing greater access to the sun for their neighbors to the north. It’s easy to see why this is a better approach for urban planning that will increasingly need to accommodate solar access. Elizabeth and Jess planning their attack based on the paper prototype model from yesterday. Today was a process indeed. 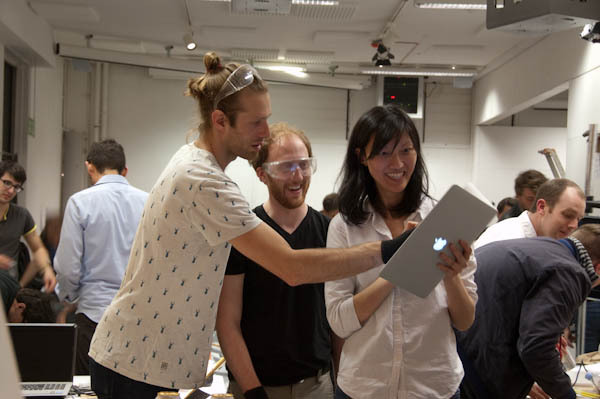 We worked hard on constructing our prototype “object” (for lack of a better description). It was a learning experience. And if the product were the goal, rather than the process, a bit of a disaster as well. 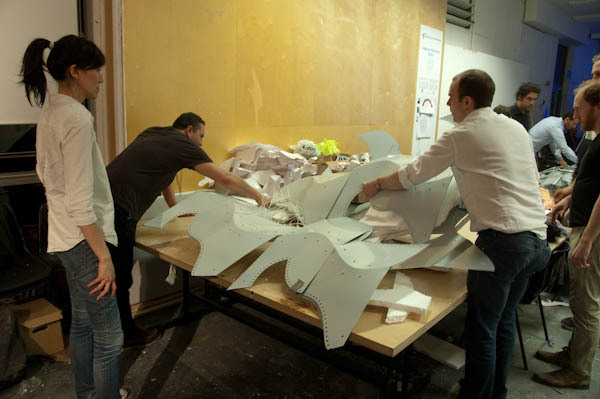 The process taught us a lot about scale of the material versus the fabricated form. The assembly underway, currently resembling a car crash more than architecture! First, it became clear that the aluminum sheets could not be bent to designed angles without snapping. But bending it less meant that curves which were supposed to match between different elements no longer did. And you rarely succeed in making a perfect run on the laser cutter with no extra allowed for error. So we ended up with a few pieces made from different material with different brittleness and flexibility. We had intended to bend the materials using the robots at RoboFold, but time constraints made that impossible, so we had to bend them by hand. But bending by hand also proved to be impossible given the thickness of material provided. Greg, Justin and Elizabeth trying to figure out which piece goes on next based on the computer model. I’m a bit disappointed in our results, which certainly have not lived up to my expectations. But the process has been great. I have learned a great deal and made some excellent new friends. I believe we’ve reached the limit of what can be learned from this prototype. And while I know some of our group intend to continue working on the project tomorrow instead of going to the talks, I’m inclined to let it go and move on. I suspect I will gain more from attending tomorrow’s “TalkShop” lectures than from attempting to force additional metal pieces into positions they have no innate desire to inhabit. But then again, I am torn by loyalty to my team and friends. What a great way to spend a week in London. Midnight, last workshop day at Smartgeometry. No one going back to the hotel yet.